A Canadian-led international team of astronomers recently discovered for the first time observational evidence in how some features at the surface of the hot massive supergiant star Zeta Puppis induce the formation of fundamental structures in its wind. We are the children of stars. But it is more precise to say that we are the children of massive stars. Indeed, in contrast to cool low-mass stars like the Sun, hot massive stars are scarce, possess extremely strong winds, and catastrophically end their lives as supernovae that stir up and enrich the interstellar medium with chemical elements involved in the creation of new stars and even planets like Earth. Thus, the research team’s breakthrough results on the hot massive supergiant star Zeta Puppis are a significant step towards a better understanding of the true nature of hot massive stars which play a crucial role in the evolution of the Universe. The research team used the network of nanosatellites of the BRIght Target Explorer (BRITE) space mission to monitor the visible brightness changes coming from the surface of Zeta Puppis over about six months, and simultaneously monitored the behavior of the wind of the star from several ground-based professional and amateur observatories. The observations revealed a 1.78-day periodicity both at the surface and in the wind of Zeta Puppis. 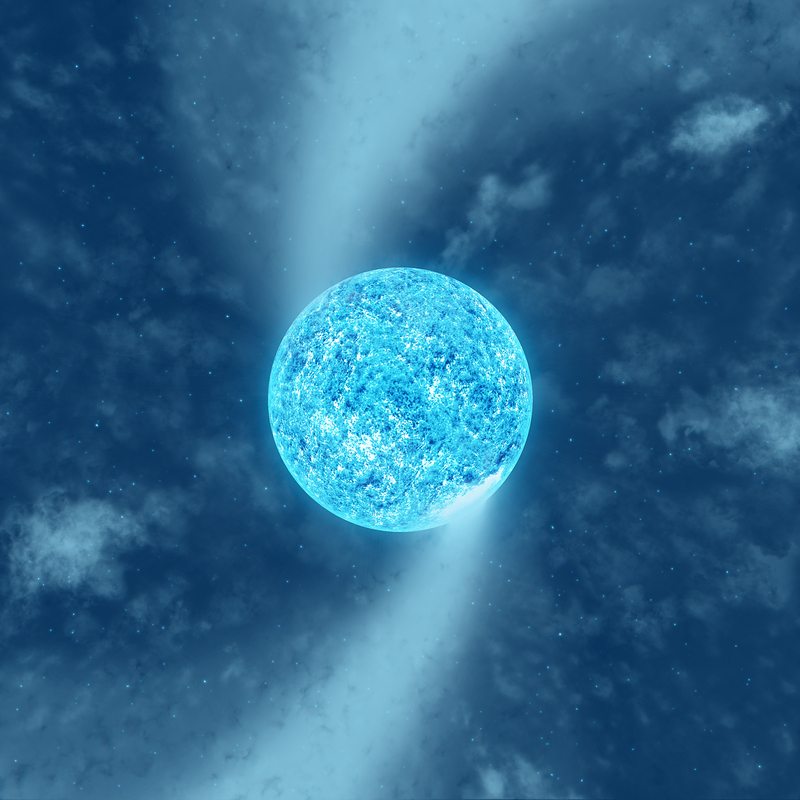 The behaviour of this periodic signal turns out to reflect the spinning of the star through the presence of slowly evolving bright spots tied to its surface, which are driving large-scale spiral-like structures dubbed corotating interaction regions (CIRs) in its wind. “Once we found that the variations in the brightness of Zeta Pup arise because bright spots on its surface are carried into and out of our view by the star’s rotation every 1.78 days, we employed an algorithm that used those brightness variations to make maps showing where the bright spots are on the star’s surface and how they change over time. Then by studying the light emitted at a specific wavelength by ionized helium from the star’s wind, we clearly saw some “S” patterns that are caused by arms of CIRs induced in the wind by the bright surface spots!”, explains Tahina Ramiaramanantsoa, PhD student at the Université de Montréal and member of the Center for Research in Astrophysics of Quebec (CRAQ), who led the investigation and the paper reporting on the results recently published in the Monthly Notices of the Royal Astronomical Society (MNRAS). In addition to the 1.78-day periodicity, the research team also detected random changes on timescales of hours at the surface of Zeta Puppis, strongly correlated with the behavior of small regions of higher density in the wind known as “clumps” that travel outward from the star. “These results are very exciting because we also find evidence, for the first time, of a direct link between surface variations and wind clumping, both random in nature”, comments investigating team and CRAQ member Anthony Moffat, professor emeritus at Université de Montréal, and Principal Investigator for the Canadian contribution to the BRITE mission. The southern naked-eye bright star Zeta Puppis is an evolved massive star currently at the stage of supergiant. It is often considered as the archetype of hot massive stars with strong stellar winds. Indeed, about sixty times more massive and seven times hotter than the Sun, Zeta Puppis has a stellar wind about a billion times stronger than that of the Sun. In that sense, the solar wind that drives aurorae and shapes the tails of comets appears like a light breeze when compared to the gale-force wind from Zeta Puppis. Also, most massive stars occur in binary or multiple systems. However, Zeta Puppis is particular because not only is it amongst the few massive stars known to be single, but also it is moving through space at a particularly fast velocity of about 60 km/s. Imagine an object about sixty times the mass of the Sun travelling about sixty times faster than a speeding bullet! “The existing theoretical scenarios that explain this high peculiar space velocity for Zeta Pup involve past interactions within a binary or a multiple system, and predicted a relatively short rotation period for the star. That prediction is now supported by these new observational results!”, exclaims investigating team member Dany Vanbeveren, professor at Vrije Universiteit Brussel. The physical origins of the bright surface spots and the random brightness variations discovered in Zeta Puppis remain unknown at this point, and will be the subject of further investigations, probably requiring other types of observations. Actually, an existing theory is that, within the huge radiative envelopes of massive stars, there is probably a thin convective layer close to the stellar surface. This sub-surface convection zone could be the site for the generation of small-scale magnetic fields, which could occasionally breach through the stellar surface and produce magnetic bright spots. The formation of clumps at the very base of the wind could also be induced by waves randomly excited from that sub-surface convection layer or even from the deep convective core. After several decades of puzzling over the potential link between the surface variability of very hot massive stars and their wind variability, these results are a significant breakthrough in massive star research, essentially owing to the BRITE nanosats and the large contribution by amateur astronomers. “It is really exciting to know that, even in the era of giant professional telescopes, dedicated amateur astronomers using off-the-shelf equipment at their backyard observatories can play a significant role at the scientific front!”, says investigating team member Paul Luckas from the International Centre for Radio Astronomy Research (ICRAR) at the University of Western Australia. Paul is one of the six amateur astronomers who intensively observed Zeta Puppis from their backyard small observatories during the observing campaign, as part of the Southern Amateur Spectroscopy initiative. ← The image entitled Flamboyant Galaxy wins the public award for the 2017 edition of the Acfas “La preuve par l’image” competition.